Hot of the Press . . . drum role, please . 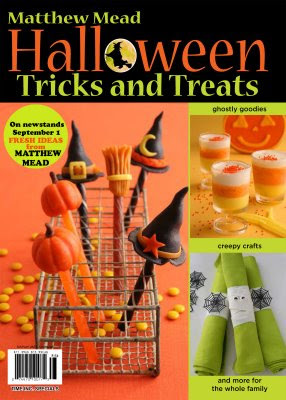 . . Matthew Mead has a new magazine! It can found now in stores across the US and Canada! Check it out at http://www.matthewmeadstyle.com/index.php?option=com_flippingbook&Itemid=142 for more info. To be honest with you until I found out he would be at the Junk Bonanza, I really didn't know who "Matthew Mead" was. I don't know if I just had my head in the sand or what! But I have to say since meeting him and purchasing a couple of his books (which I was able to have him sign), I've become a newbie fan-atic! His books have so many fabulous and wonderful things found inside them. He's truly a genius at his craft. and every page is chocked full of amazing things! I was truely excited and honored to meet him (and his wife). As I scoured his books, I especially loved, from the "Gifts from Nature" book, the Christmas stocking with the added fresh greens at the top . . . or the framed fern leaf . . . or I also loved the Easter Egg Garland . . . or the room with the beach theme. Everything was so extraordinary, it really is hard to pick a favorite. If you don't know who Matthew Mead is, you definately have to check out his new magazine! I'll be waiting eagerly for each issue! Your rock, Matthew! Just in time! I am off to see which entries come up using the random number tool, and to send the entries to Matthew for him to choose the top prizes. Good luck, and thanks for participating in the contest!! Hi Lani, sorry I didn't stop to visit you at the JB, but I didn't recognize you. I promise I wasn't being snooty :). There was so much to see, what a wonderful show. I'm sure I saw your booth many times. Hope you did great there. Show us some pics of your space. P.S. You heading to the Fargo Home Show? Hi, Amy! Don't have your e-mail address so hope you get this. Don't know yet if I'm going to Fargo yet. You going? E-mail me and we can connect and figure it out. Thanks!